Do You Want to Return to Your Country or Stay in the U.S.? Do you want to return to your country to visit, to study, or to live? Maybe you are like me or some other students I spoke to. 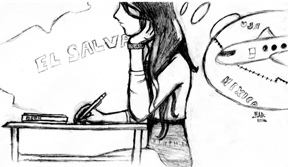 I am a student of the 11th grade and I am from El Salvador. At first when I just came to the U.S., it was difficult for me to think about the idea of being in this country because I was not used to the life here. Although I could not say it then, it was a difficult life for me. Every time I thought about the people I loved who were in El Salvador my real desire was to go back. When I listened to some of my nephews’ voices on the phone, I felt my heart break in pieces. The only thing that I wanted was to have them next to me, to hug them and to tell them how much I loved and missed them. However, I knew that it would weaken me and my desires to go back would be even greater. Jenny another junior from Guatemala at Blair thinks the same thing. “I would go to visit, but I have already adapted to life here,” Jenny said. But not everyone wants to stay in the U.S. Sonia, a student of the 12th grade, desires to go back to live in El Salvador again. For Sonia the life is not equal here and she prefers her country. In her country, she has left a person that misses a lot. “In El Salvador, I have my sister, the person that I most love,” Sonia, said. For some people is more difficult to get used to the U.S. than it is for others. Since in their countries they had a better life than what they are having here. Their parents sent them money to live and to study in their countries, and as soon as they are here they feel that living here is more difficult. “At first it was hard, I was home all day and it was difficult for me to get used to the U.S,” Emily a junior at Blair said. Also, some students complain that their parents brought them here and that they had a better life in their countries. In my case of the only thing that I repent most when I came here, is to have lost my time with my older brothers. Being here, I have realized unfortunately that I was never able to tell them personally that I love them a lot. If I go to my country, the first thing that I will do is to spend more time with my brothers and my family, to show them the love that I never showed them when I was there.